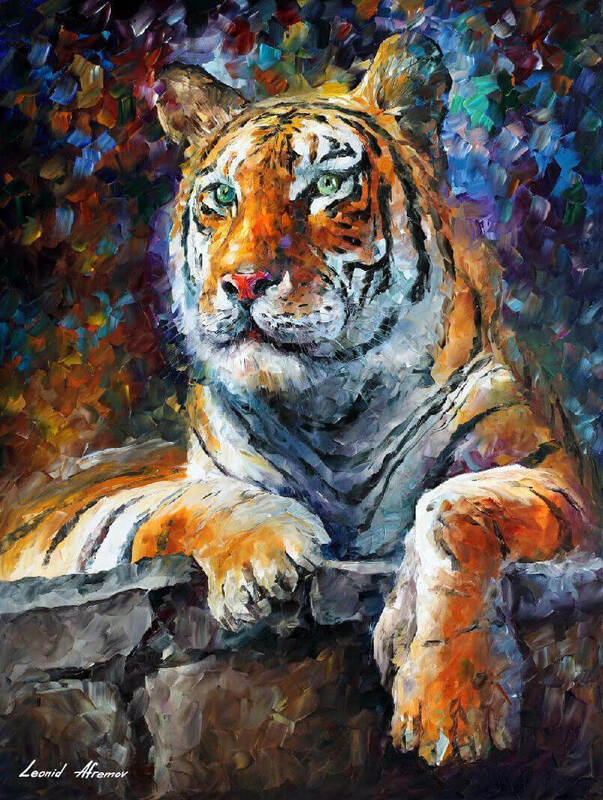 I would like to present my hand painted oil on canvas painting (recreation) of the artwork BEAUTIFUL SIBERIAN TIGER. I made this piece with the same amount of soul and emotion just like the first original painting. This piece is created with oil paint on artistic canvas using my unique technique of a palette knife. The artwork has texture, you can feel the strokes by touching the painting. By purchasing on this site, you are buying directly from the artist Leonid Afremov. I guarantee your satisfaction and the best customer experience. I can't give enough praise to the beauty of these oil paintings! I purchased my first apartment two months ago and I've already bought 8 (YES EIGHT!!) of Leonid's masterpieces to hang on my walls. Keep an eye on his facebook page, he makes generous offers to his fans that help us "regular joes" own pieces of museum quality work! Customer service is also amazing, I've had several back and forth emails with Boris and they truly are 100% dedicated to ensuring your complete satisfaction with your purchase! I would like to say, that these paintings are amazing. I ordered the "John Lennon" portrait for my parents and they love it. I finally ordered one for myself, "summer scent", which I also got, "Brown Bridge", free. They just arrived today and are exceptionally beautiful. If anyone is ever skeptical about the price or quality, just read the reviews. Leonid is amazing.